Demand for electricity in the United States has gone up in all but four years since 1949. The Department of Energy predicts growth in capacity of 0.6% per year through the year 2040. Many states and utilities have long considered energy efficiency a resource for satisfying growing demand. According to a study by the American Council for an Energy-Efficient Economy, saving a kWh through an energy efficiency program costs about 2.5 cents, about a third of the cost of building new capacity. DOE expects end-use energy efficiency and demand response to reduce peak demand for power by 5% over the next 10 years. Lighting controls will play a major part of these efficiency improvements as well as demand response. Spending on energy efficiency programs has been increasing dramatically in recent years in the U.S. and Canada. Commercial and industrial electric programs have traditionally run about 35% of total spending, so that would be about $3 billion spent in 2011. 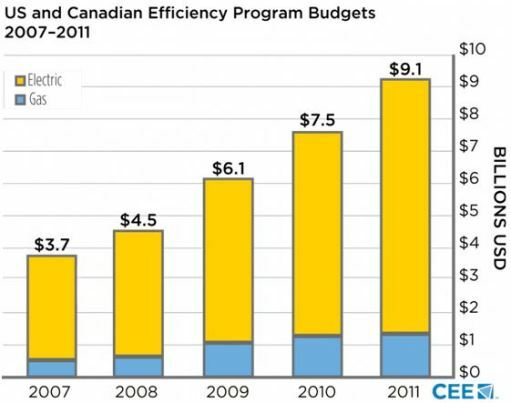 US and Canadian Efficiency Program Budgets 2007-2011. Consortium for Energy Efficiency. State of the Efficiency Program Industry: Budgets, Expenditures, and Impacts 2011. http://www.cee1.org/annual-industry-reports, posted March 2012. © Copyright 2012 Consortium for Energy Efficiency. All rights reserved. A key component of these energy efficiency programs is the rebate. You agree to install a product that satisfies certain performance criteria, and you get a check to reduce the initial cost and make that product more attractive to install. According to BriteSwitch, more than 70% of the U.S. is covered by an active rebate program covering commercial lighting. The prescriptive product rebate remains the most popular type of rebate. This is a cash rebate promoting specific qualifying lighting upgrade options. The amount of the incentive varies widely, with the average rebate improving payback by up to 20-25%, making these technologies more attractive for owner investment by reducing initial cost. The two major trends in rebates are coverage of LED products and lighting controls, says Leendert Jan Enthoven, president of BriteSwitch. Regarding lighting controls, controls are now common in rebate programs, with the number of rebate programs almost tripling since 2009. “For control rebates, there is still a great opportunity across the country for many different types of technologies,” says Enthoven. The most popular control rebates are remote-, wallbox- and fixture-mounted occupancy sensors, photosensors and dimming daylight harvesting systems (see table below). The actual rebate earned may depend on whether the project is new or existing construction. The controls may be required to be listed by UL or other OSHA-approved testing laboratory. For a list of rebates and other energy incentives available across the United States, click here. Pre-approval is often required before equipment is purchased, a process that can take as long as about a month. Enthoven adds it can take up to 120 days or longer for the rebate check to be delivered. Because strong participation is draining program funds earlier in the year in some regions, check with the utility that funding will be sufficient to ensure promised rebates will be delivered.